I was going to post a picture of the windows but Tek Screw beat me to it. The rear (southern) crane was gaining height today with another tower section about to be inserted at the top of the tower. The lift towers as seen from Waymouth St (east of site). Now have black (dark grey) wall panels on southern end as well as black windows. They are actually taking this crane down for some reason (? ).As at 5.30 pm the main luffing beam, the A Frame and the drive motor had been removed. Too late for a picture. Maybe this crane suffered some mechanical failure. The remaining crane is not long enough to cover the whole site. It could have something to do with the airport. I was only thinking the other day the cranes appeared to exceed the allowable building heights when extended. May change it to a hammerhead. From Grenfell Street. Couple of big mobiles in the alley as well. 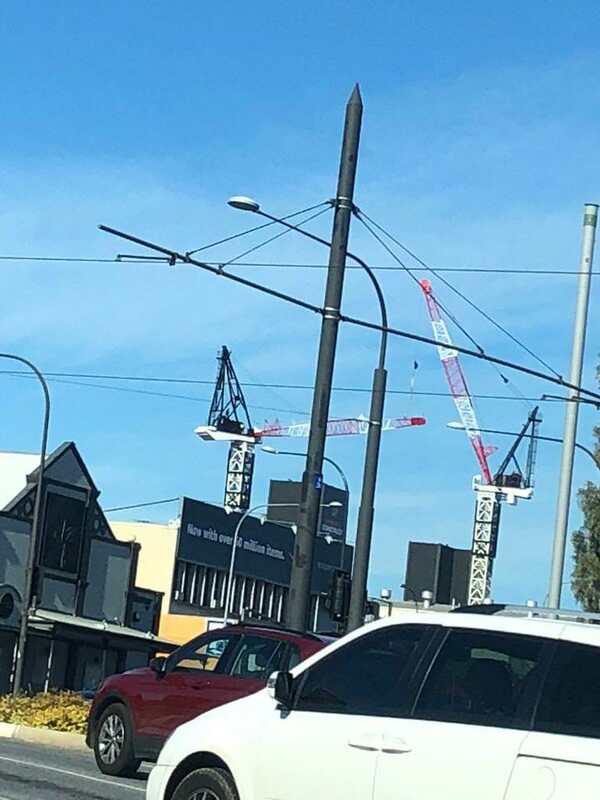 The fact that the large mobile has gone and the crane is basically still there leads me to think there must be some mechanical fault with the motor and the crane will be reassembled at some time soon? The smaller mobile is doing the work of the tower crane. I heard last week that one of the cranes wasn't working. Good to see they are sorting it out as this building should be flying up. The Slimdek system they're using is very fast normally. More dark grey windows on south side facing Albert St.
Now have some new 'Black and white' window panels -26/6/18. The black and white windows.